On most every international dance day, I spend the day in the dance studio watching and dancing, sounds fitting right? Well, along with many other things, my dancing habits have changed this year with my transition to university and I wasn’t in the dance studio today. But, that doesn’t mean I didn’t experience dance. Instead, today I watched the dancing that happens in my backyard. It’s 8:30 now, dusk. I’ve spent the past 20 minutes sitting on my back deck. To the accompaniment of the crickets, birds, and occasional pheasant, I watched the trees as they swayed in the breeze, each branch taking a slightly different path. I watched the birds as they chased each other through the air, the most free and fun game of tag I’ve ever watched. I sat with my eyes closed and felt the wind dancing across my face, playfully moving the stray hairs that came loose from my ponytail. I watched the clouds as they rolled and moved across the sky, slowly coming closer and closer, until the dark mass was completely overhead. I watched the sun dance on the horizon as it said its last goodbye of the day. The chill of late April is setting in as the sun recedes further below the horizon. The rain is just beginning to fall onto my keyboard. What a beautiful dance the raindrops do. Tonight was a beautiful reminder that dancing doesn’t have to happen in a studio or on stage, but that nature is always putting on a beautiful show if you only take the time to watch and listen. As I am writing this, I am waiting for my Tall Guy Painter to come and remove my kitchen and family room cupboard doors and drawer fronts. I decided a couple of months ago that it was time for a refresh paint job. With this decision comes a number of decisions, the first one being how the job would get done. After repainting my master bathroom this winter, including all my built-ins, I decided the task of the kitchen and family room was going to get the extra attention of the experts! After making the decision to go ahead with the project, comes the dreaded paint colour decision. Now don’t get me wrong, I LOVE picking paint colours! I love perusing Pinterest and home decor magazines looking for that colour that catches my eye. For me, it’s a bit of a process. 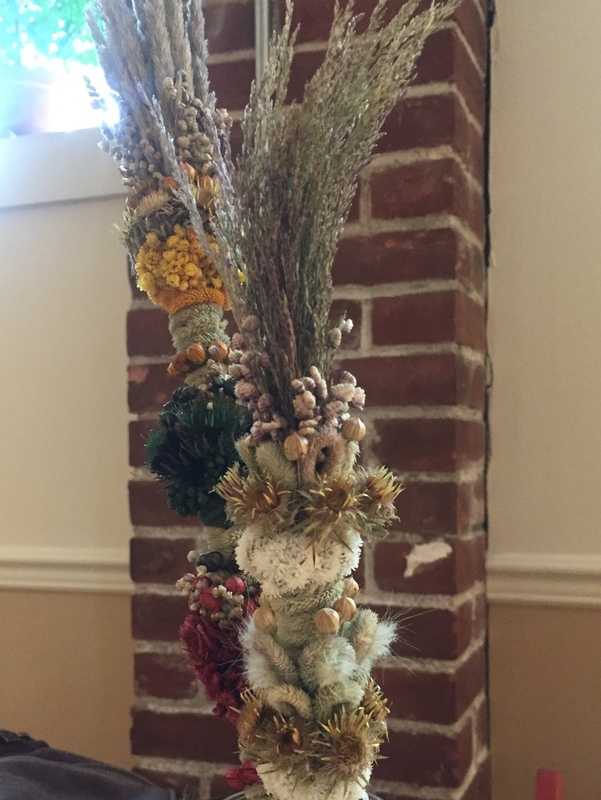 Here is my Pinterest Board for this project….. It seems I’m always looking at paint colours. If I see something that catches my eye in a magazine, I clip out the photo. I’m always excited to read about the latest “colour of the year” that the design world comes up with based on trends they are seeing. And I can be found looking at paint chips in my local hardware store……yes, I’m that person. Getting a hold of the paint chip is really important. You need to compare that chip to other chips and see the subtle differences in the colour. This is how I narrowed down the choice to two or three options. Too many choices can be overwhelming, so I recommend to keep the number down. After much consideration, I thought I had made a decision. I had time, so I thought I would paint my mudroom storage cubes in the new colour. It needed to be painted, and my mudroom is also included in this project. I moved the storage piece around my kitchen, near the window, beside the island (which happens to be stained and will remain that way) and obviously in the mudroom. I liked the colour, but something was holding me back. A trip back to the paint store, and another sample pot in hand, I painted on my cupboards. Two colours, side by side, on three separate doors. The second sample was the winner in my mind, and seeing it on the surface made the decision easy. Now I don’t necessarily go to this much trouble for every painting job. But sometimes it is worth the extra time. And ask for friends opinions, if you dare! In the end it’s you that needs to live with the colour. Go with your gut. I posted one of these photos on social media, and the clear response was for the colour that didn’t win. It may have been partly the colour name -Moonshine, but lighting and photos aren’t always true to life. Recap of steps to picking the right colour…. Ask friends for suggestions….if you dare. As I’m sure many of you can relate, it seems that my “to-read” list is never-ending and always growing. There’s so many amazing authors and intriguing stories to read, and it seems that my interests are growing faster than my reading can keep up. I keep a list on my phone, and whenever someone makes a good recommendation I always add it to my list. Today I want to share my list with you so that your list can keep growing too! If you have any recommendations of things to add to my list PLEASE share in the comments, I love getting new ideas. 1984 by George Orwell. I know! This is a classic and I’ve yet to read it. That’s why it’s the very first one on my list. Somehow it keeps getting bumped behind newer and more exciting reads, but I’m determined to read it this summer. Why I am Muslim by Asma Gull Hasan. This book is about an American Muslim woman who has dedicated much of her time to fighting anti-Muslim prejudice. She shares passionately what Islam means to her and lets readers into her mind as a Muslim growing up in Colorado. Becoming Human by Jean Vanier. My first-year classmates and professors couldn’t say enough good about this book and this man, and for that reason I can’t wait to get my hands on this book. Jean Vanier founded the L’Arche communities for people with intellectual disabilities, and uses this book as a call to action for the common good of the world. He calls people to be open and accepting in order to find true freedom. Nature and Selected Essays by Ralph Waldo Emerson. I mean, any reading list isn’t complete without some Emerson. He’s a great mind, a great writer, and an intriguing philosopher. Plato’s Republic. I honestly don’t know much about this writing, but as Plato’s most widely read and known piece, it’s on my long-term list. The Giving Tree by Shel Silverstein. I know this is a children’s book, but for some reason I’ve yet to read it. It’s something I’d love to read and explore with a young one. Eighteen Years by Madisen Kuhn. Madisen is a 21-year-old writer and college student. She has a book called Eighteen Years, it’s a collection of poems that she self-published at 19 years old. The Origins of Virtues by Matt Ridley. This book examines the behaviour of humans and explores the roots of self-interest, community, cooperation etc. Bowling Alone by Robert Putnam. This book examines the disconnect that is so common in Western society. From our families, to our friends, to our political systems, we are very disconnected. Putnam examines this trend and lets readers in on how we may reconnect. The Mind’s Own Physician by the Dalai Lama. Just another book about mindfulness and meditation, but wait! This one is written by the Dalai Lama, it must be good. This Changes Everything by Naomi Klein. Klein says that Climate Change isn’t about carbon, it’s about capitalism. The book changes the debate to capitalism vs. our earth. I think it’s definitely worth a read. Citizens Adrift by Paul Howe. This book looks at political engagement, or rather, disengagement, and focuses specifically on youth in Canada. Howe identifies trends that are causing the disengagement and suggests that young people can be put back on the path to democratic engagement. The Tipping Point by Malcolm Gladwell. I can’t wait to read this one! Gladwell talks about the dissemination of ideas and trends and the tipping point phenomenon. The tipping point is the point at which something spreads like wildfire, whether it’s the flu or a campaign, everyone wants to know about it. Essential oils are quite popular right now. I bet you’ve gone into stores, looked at the rows of tiny little bottles with high price tags, and walked out feeling overwhelmed by the endless options (probably more than once). I did this myself several times before finally taking the time to do some research, talk to some people, and buy my own. In a diffuser: add a couple drops of your favourite oil to a diffuser, add water, and soon your whole room will smell wonderful! Add some to your bath! My calm and settle blend is my favourite oil to add to my bath, it makes for the perfect atmosphere for a relaxing bath. Put a couple drops on your pillow. Lavender and chamomile are great for this and help send you off into a deep sleep. Mix into lotion for a great self-massage. Sometimes I add oils to unscented lotion while I’m rubbing my feet or moisturising after the shower or bath. Lemon: I love the freshness of this scent. It makes my room smell clean and fresh and gives me a nice little boost of energy. Eucalyptus: This is my go-to oil for when I’m sick. I’ll put a couple of drops into my diffuser or my bath and soak in all the benefits. A quick Google search will reveal that the benefits of eucalyptus are numerous, and I can vouch for those. Jasmine: I like this oil for its strong floral scent. Be warned: you don’t need much of this oil, it’s very strong smelling! I find this scent to be relaxing, and very pleasant, and it creates an overall beautiful atmosphere. Peppermint: One of the first oils that I bought and tried, peppermint is top of my list for energising oils. It helps me concentrate, relieves minor headaches, and gives me a great energy boost. This is my scent of choice in my diffuser while I’m studying. Calm & Settle: This is a blend of oils (Lavender, Orange, Marjoram, Rose, Geranium, and Bergamot) that I bought at my local Farmer’s Market. It’s absolutely fabulous and undoubtedly lives up to its name. I would recommend oils blends for their depth. The combination of scents allows for a layered and deep aroma that doesn’t come with most of the single oils. Thank you for reading. I hope this is a bit of a guide that could help you pick out some of your first oils, or help build your library. As Ashlyn is writing her last exam of the semester, I am sitting in the Harriet Irving Library at UNB, or HIL as the students would say. Tomorrow is the last day of exams, so many students have already left campus for the summer. I miss the campus vibe from my days as a student. I have great memories of friends and favourite hangouts at Dalhousie in Halifax. Today I made the trip to Fredericton with Ashlyn to help her pack up her dorm room, and visit some of her favourite spots in the city. It was fun to see the places she’s talked about since September. It’s almost like reliving my student days. Our first stop was Milda’s Pizza in the Charlotte Street Arts Centre. The wood fired pizza is delicious, and they have great coffee and sweet treats too! This little gem is near Renaissance College, where Ashlyn is studying. I can see why it’s a favourite hangout. The tables had dried flower arrangements that is a custom of Lithuania. 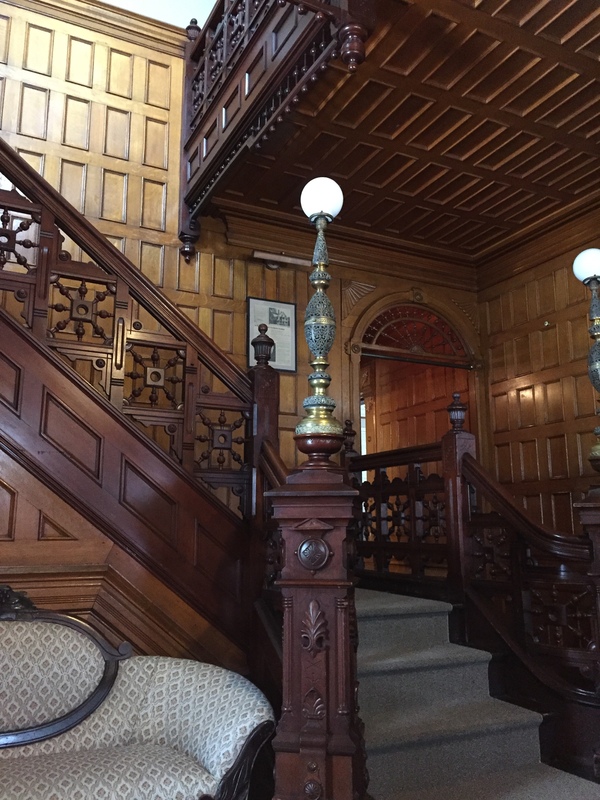 The Victorian mansion on Charlotte Street that houses the Renaissance Collge of UNB was also on our list. The beauty of the building amazes me each time I visit. The woodwork is grand and so detailed. Imagine the stories those walls could tell…. 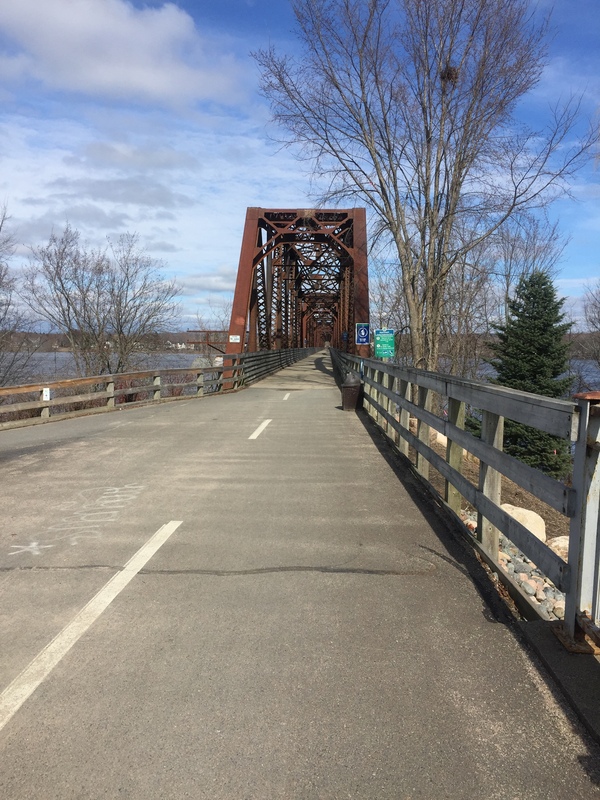 It wouldn’t be a proper visit to Fredericton without a walk across the train bridge. An icon that I have seen in a lot of photos, and looked at as I drive by. Today we walked across the bridge, admiring the few signs of spring with fellow pedestrians and cyclists. 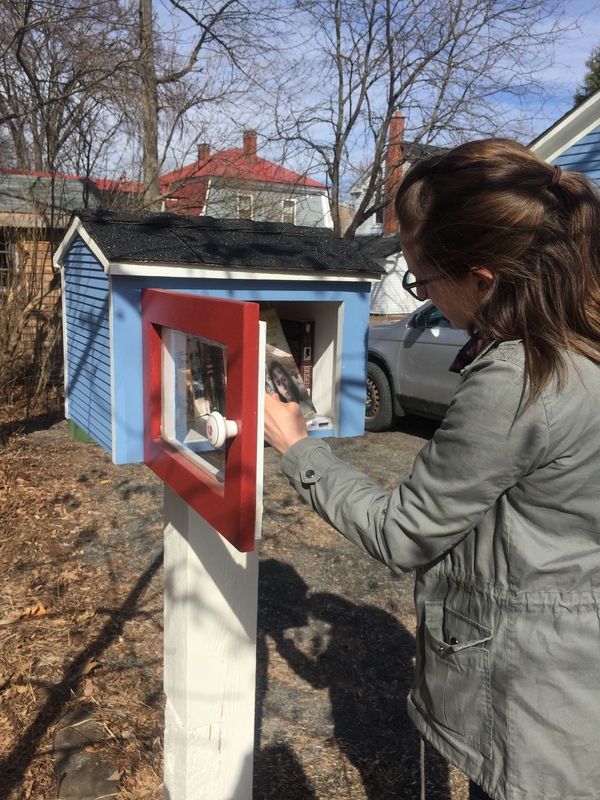 Fredericton has at least a couple of little free library locations on its streets. 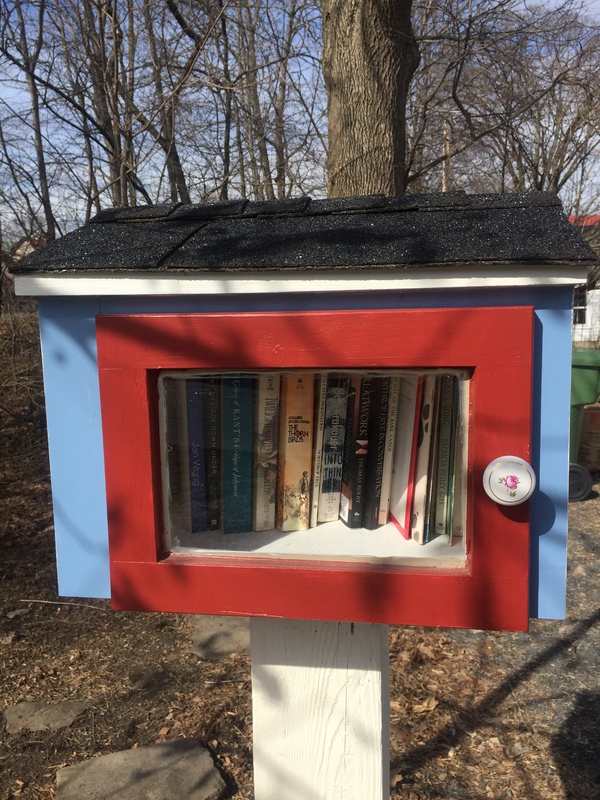 These cute little houses on posts are filled with books for borrowing. The idea being you borrow or exchange or donate a book. There was one near the path to the bridge, so we stopped to see what treasures were inside. The wooden box had a glass door, and a shingled roof so the books would stay dry. 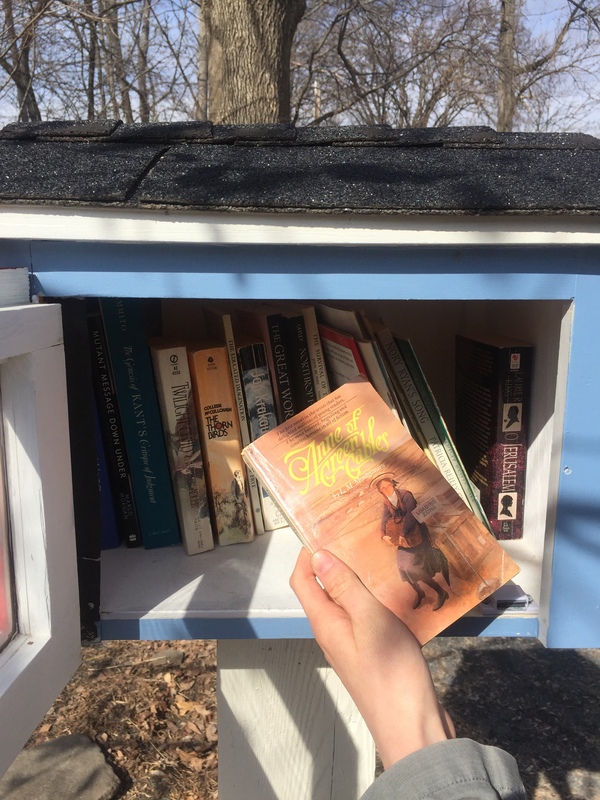 We found everything from Anne of Green Gables (a favourite from my childhood) to a philosophy book and children’s books. 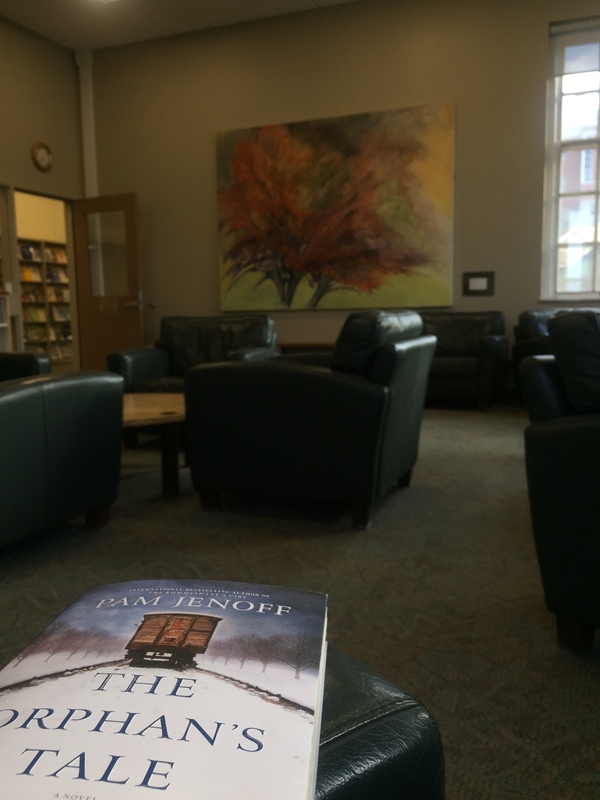 Now back to reading The Orphan’s Tale by Pam Jenoff. I’m only one chapter in at this point, but I will share my thoughts when I finish…. The first thing I thought of when moving into my first apartment was my bed. I love my bed at home, but I’d need another one for my apartment. I didn’t really want to buy a new one, I thought this would be the perfect opportunity for a refinishing project! So, I went searching through my basement and asking my family what they wanted to get rid of. Turns out we had a wooden bed frame from my great-grandmother’s house just sitting in the basement, waiting for this project. So, what we had to start with was a stained maple bed frame from around the 60’s (although we aren’t entirely sure). We did some searching on Pinterest and found another DIYer who had done something similar to what we wanted. We used her process as a guide and jumped right in! Check out her post here. This step was messy! Mom had to work that day so I was left to do it all by myself (that’s a lot of trust). The materials I used were a furniture stripper, a plastic scraper, and a stripping pad (to remove the excess residue). I used an inexpensive paint brush to coat the stripper on the wood. It’s important to make sure you put a thick layer on to remove all of the layers. The messy part comes after waiting 15 minutes. After 15 minutes use the plastic scraper to remove as much of the mess as possible. I had to repeat this process on most of the surfaces of the bed frame as there were some tough spots. All together this process took about 2.5 hours so it was easily done in a morning. Step 2: After a quick sanding the next step was to whitewash the wood. To do this we mixed white paint and water. I wish I could tell you the ratio, of water to paint, but since mom has some experience whitewashing we just mixed it up until it was the consistency we wanted. It took a couple of tries but we got the look we wanted pretty quickly. In the end, we painted the paint/water mixture, let it set for 15 minutes, then wiped it off with a rag. Step 3: We waited overnight, then moved onto step three. This step was the easiest and quickest. We simply applied a dark wood stain with a cotton rag, waited approximately 1 minute before wiping it off with another cotton rag. For this step it was helpful to have both my mom and myself; she applied the stain, and I followed behind her wiping it off. Check back for some more DIY’s as I settle into my new apartment. This is my response to Alan Doyle’s best-selling book Where I Belong. I grew up listening to Great Big Sea. Every summer in my Dad’s pickup truck, towing our camper behind us, we would listen to their album Sea of No Cares on repeat. My sister and I knew every word by heart and definitely had our favourite tracks, although we didn’t always agree. Since their album cover was a large goldfish, I always called them Great Big Fish instead of Great Big Sea, this always provided some good laughs. Alan Doyle’s book came to me at a really perfect time. My sister bought it for me this past Christmas, but I just got the time to pick it up in the past couple of weeks since I came home from university. His fond words and tales about growing up in a small town were extremely touching and all I could think about the whole time is how much I love my own home here in Nova Scotia. It’s an average Nova Scotia town with familiar faces on every corner, teenagers who “just want out”, and a special magic for the people who have spent their entire lives here. What makes it special for me is the people. There’s so many people who keep this little town running, and for them, I am so grateful. From local business owners to dedicated volunteers, from young, motivated students to long-time givers. The people that are at every event, do their best to buy local, and are always bringing people together for some reason or another. The people that make this town special are the people who give their whole heart to making it such a great place to live. Everyone brings something a little different to the town, and altogether it makes for something especially beautiful. With a global trend of people moving from rural places to larger urban centres, I think it’s incredibly important to take the time to appreciate the beauty of a small town and the tight-knit community that comes with it. These are the thoughts I’ve been having as I read Alan Doyle’s book. He recounts numerous stories of growing up in Petty Harbour, Newfoundland, and they keep reminding me of my fond memories of growing up in Amherst, Nova Scotia. I think this book is great for anyone who wants to take a pause and remember the place they grew up. Whether it’s a small village or large city, Where I Belong is bound to bring back some special memories. I can’t believe I’ve already finished my first two semesters of university. They say that time flies when you’re having fun, and I truly was. I found joy in going to class every day, I found energy in being surrounded by my peers, and I found passion in opening my mind to learning new things. Although for some people university can be an overwhelming and emotional experience (and it was for me at times as well), I found it to be a creative hub and a comfortable home. I loved the energy that came from a campus full of young, intelligent people, I loved the connections that could be made between teacher and student, and I loved the ever-present atmosphere of learning. I think the reason that I enjoyed my first year of university so much was because I was doing something that I could put my heart into, something that I really loved. I crossed paths with many other students who were feeling burnt-out or lacking motivation to complete their school work, and, I won’t lie, I wasn’t always excited to write papers and complete assignment, but I couldn’t help but question what was different between myself and them? Why did they dread class, when that was the thing I looked forward to every day? Amidst all the other things that I learned in my first year, my biggest takeaway is that in order to succeed, I have to love what I’m doing. For some people that might be different, they might find fulfillment in activities outside of academia, but, for me, I have to love being a Renaissance College student. Hopefully in two short years, my love for what I’m learning will result in a fancy piece of paper, but even if it doesn’t, oh well, we’ll cross that bridge when we get there. What matters right now is that year-one is over, and I’m looking with eager excitement to year-two. When I arrived home from university for my spring break, I found a book sitting on my bed, Letter to my Daughter by Maya Angelou. My mom had bought this book and left it there for me and I was so excited. From the little I knew about Maya Angelou, I already loved her. She is an amazing poet, activist, and all-around woman. Her famous poem Still I Rise gives me shivers every time that I read it. I’m not quite sure how to characterize this book of hers though, it doesn’t easily fit into a single genre. It’s a well-rounded collection of stories and lessons from throughout her life, some funny, some sad, and most very thought-provoking. One thing I know for sure is that it’s brilliant. I remember reading it while sitting next to a friend and having to stop and reread sections to her aloud every couple of pages, I just had to share her words. I devoured the book in a short couple of hours. Some of the short essay titles are Revelations, Home, To Tell the Truth, Surviving, and In the Valley of Humility. The titles alone are intriguing and diverse, indicative of the stories they hold. I love the way she wrote the book; it starts by briefly describing her childhood, then diving quickly into honest, and raw stories of her teen pregnancy and travels around the world. Read this book with your mother, with your kids, with your friends. Everyone should read this book and let Maya Angelou’s sweet, potent words soak into their hearts.